Honey bees live in well-organized colonies and do not require hibernation. They are best known for their production of honey, which they store in wax combs inside nests. Honey bees are generally active during the spring and summer, when they go in search of plants from which to collect pollen and nectar. Bumble bees are similar to their close relatives, the honey bees. Their colonies are headed by a queen, who is the main egg-layer, and many workers, who are the daughters of the queen, and drones (males) which are produced during the mating season. However, the colonies of bumble bees, unlike those of honey bees, only survive during the warm season; new queens hibernate alone to begin another colony the following spring. Carpenter bees are considered wood destroying insects due to the damage that they cause to wood during the construction of the brood galleries. Female Carpenter Bees can sting but rarely do so. Males will often buzz around a curious person getting too close to their nest openings. Males are unable to sting as like all male bees, wasps and hornets, they lack a stinger. The Mason Bee is a gentle beneficial insect and an excellent pollinator. It is found throughout most of North America, particularly in wooded areas but often around homes in towns and cities. This solitary insect is not destructive and does not make holes in wood. Often mistaken for honeybees, yellow jackets are just a bit quicker, smaller, and are a bright yellow color with black stripes vs. the more orange color of honeybees. These wasps are scavengers eating meats and sweets and often found in parks or disrupting picnics. They are generally found nesting in the ground, most commonly in areas with ground cover. Nests are usually softball to soccer ball size. They defend their home very aggressively. 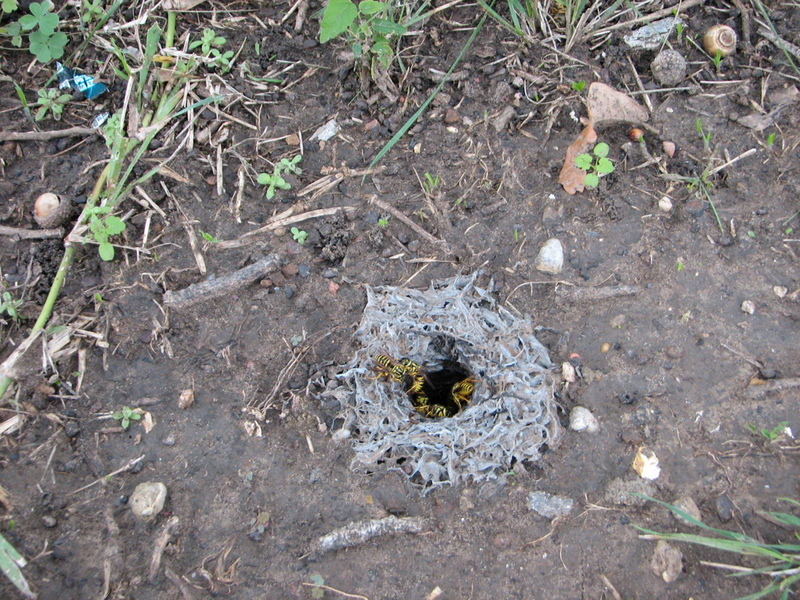 Ground hornets are the most common type of hornet we have in this area. 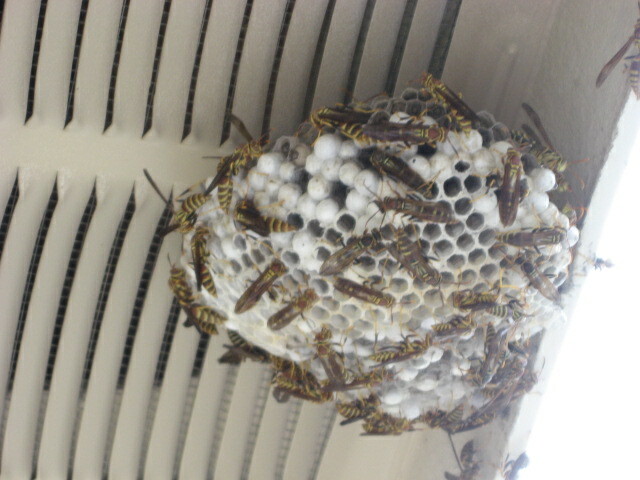 They are mostly black with pale yellow markings on the abdomen, and about 5 cm (2 inches) long. Despite their appearance, these insects usually will not bother people even when provoked. Their sting is meant for paralyzing their prey and normally does not cause a reaction in humans. They are considered beneficial because they reduce cicada populations. Paper wasps are typically long with yellow and rusty brown or black stripes. Nests are open and made of grayish paper-like material that is honeycomb shaped. Paper wasps attack when aggravated and have a painful sting; they can also sting multiple times and do not loose their stinger as honeybees do. Mud daubers have a very compressed alien like look with their skinny needle-like waist. They are commonly identified by their mud nests which are hard flat oval and tube shaped. The mud dauber species seldom sting and are not protective of their nests. Mud daubers typically attach under eaves, porches, walls and attics. Professional Non-Lethal Bee Removal Services in the Dallas-Fort Worth Metroplex.